It’s a story that we can all relate to. In fact, all of us have experienced walking into a room where we have felt like a fish out of water and sought a way to blend into an environment that is outside our usual comfort zone. Rob Giardinelli, a technology sales and marketing executive turned expert social chronicler and Senior Social Editor of The Society Diaries magazine, has spotlighted many of these experiences among the high flying Jet Set– and the life lessons he’s learned from them in his new book. 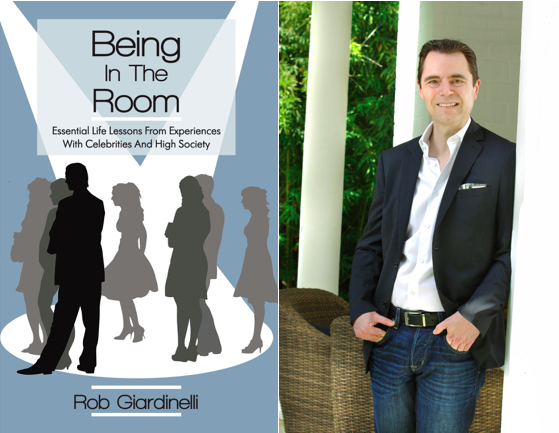 In Being In The Room: Essential Life Lessons From Experiences With Celebrities And High Society, author Rob Giardinelli shares personal stories and experiences during his six years of social chronicling. The subject? The social elite in Texas and beyond. Giardinelli’s book features 25 self-contained vignettes of gilded situations he’s personally experienced with high-profile people. With a variety of happenings that range from humorous to poignant, each of the encounters contains an important and essential life lesson he’s learned from observing this glitzy, glamorous world. This book serves as a guide for anyone who seeks to take the fear that accompanies walking into an unfamiliar experience...to turn it into an opportunity to stretch, challenge and ultimately feel comfortable in unfamiliar surroundings. It also chronicles Giardinelli’s own path of how going outside of his own comfort zone has lead his life to change in positive ways he would have never thought possible. A successful technology sales and marketing executive who happened into chronicling the world of the social elite for The Society Diaries magazine, Rob Giardinelli has encountered a spectrum of people, places and things; ranging from the casually clad brilliant engineer to the couture-gowned, internationally known socialite at a Jet Set gala. Departing the technology world to pursue a lifelong passion of helping others achieve their potential, Giardinelli now offers his skills as an executive life coach and professional workshop leader. Sharing his unique combination of corporate Fortune 500 and “Social 500” creative experiences to empower others, he promotes the idea that there is no experience or situation that is too big to handle. In doing so, he has created his first book Being In The Room: Essential Life Lessons From Experiences With Celebrities and High Society to highlight his own personal journey.